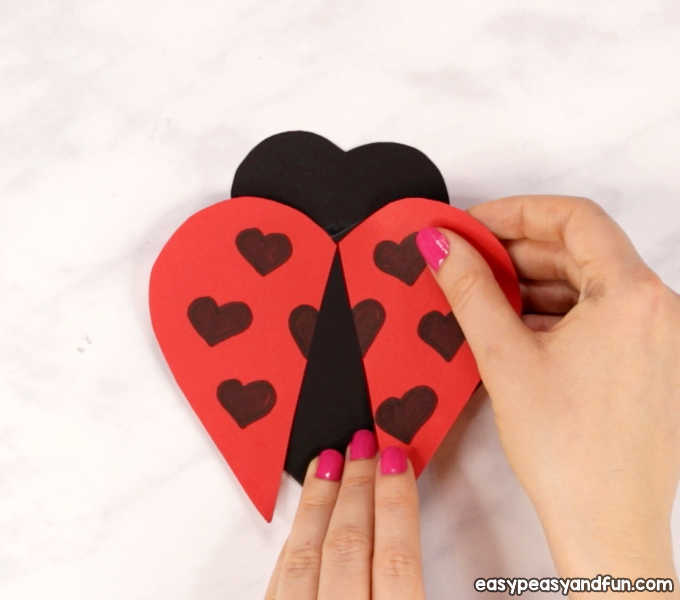 Learn how to make a simple Heart Ladybug Craft, a project that’s fun to make and makes for a super adorable DIY Valentine’s day card. 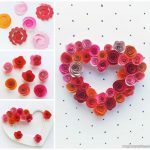 You can make them in many colors too, red, yellow, pink or why not even blue. 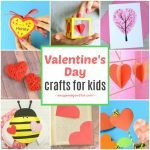 Making heart shaped animals sure is fun and if you really give it a go, you can create a whole bunch of them. 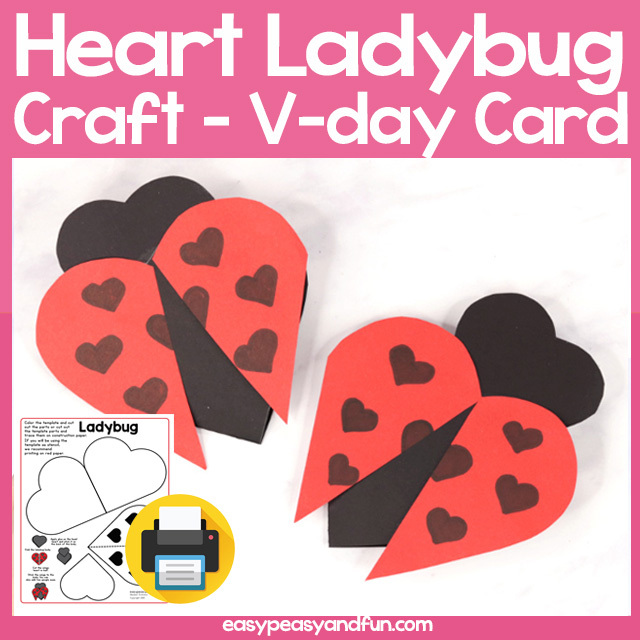 We’re feeling the ladybug today so we are going to show you how you can easily make one heart shaped ladybug card – you can use our handy template to make the card or you can draw your own hearts. 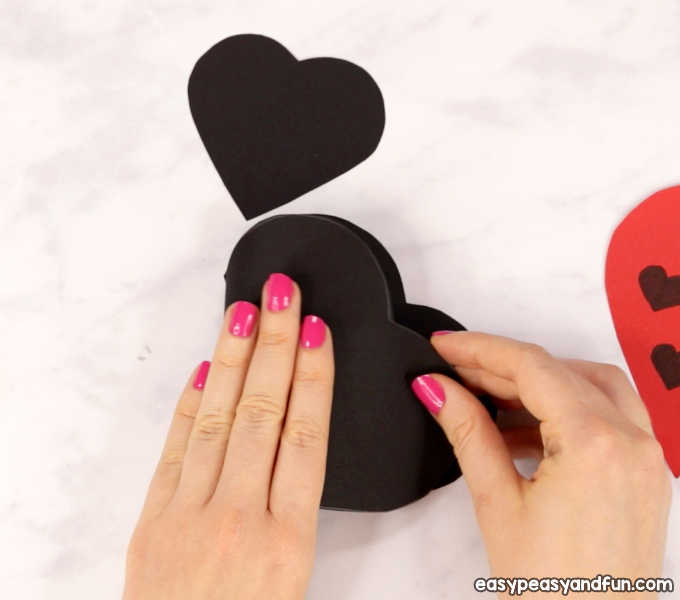 Either way, this Valentine’s day craft will be a big hit with kids. 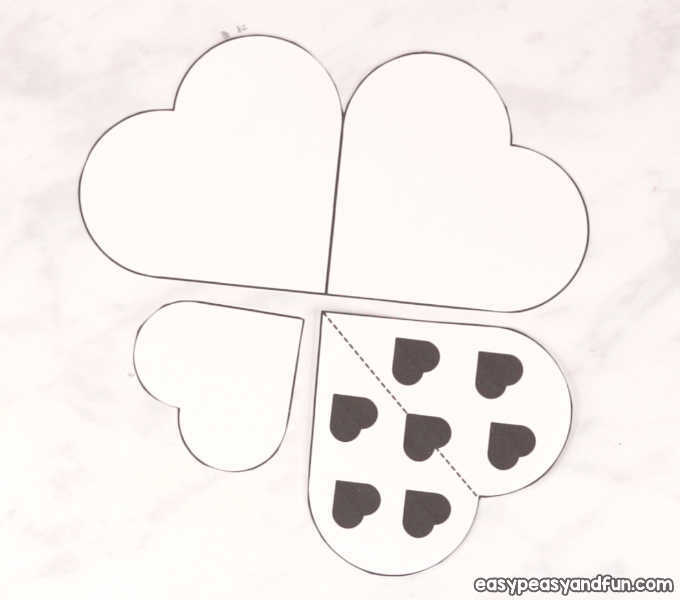 You can also print the template on white paper and have the kids color in the template. 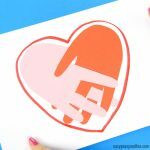 Print out our template. 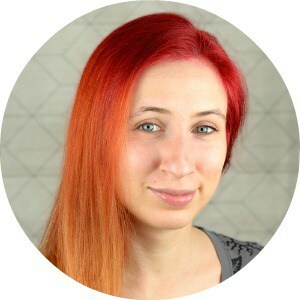 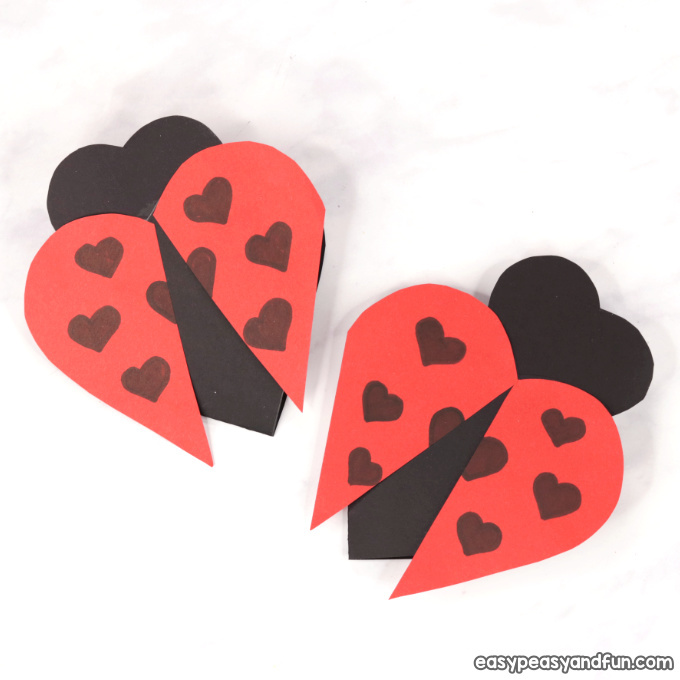 If you are going to use our template as stencil, we do recommend you print it on red heavier print paper, as this way you won’t need to cut the little black hearts to place on the ladybug’s wings. 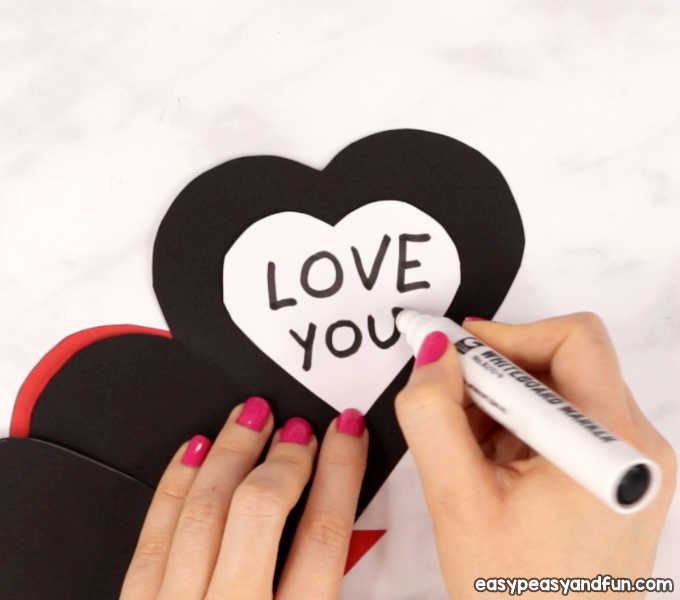 If your kids are going to color in the template, let them color it before they cut it. 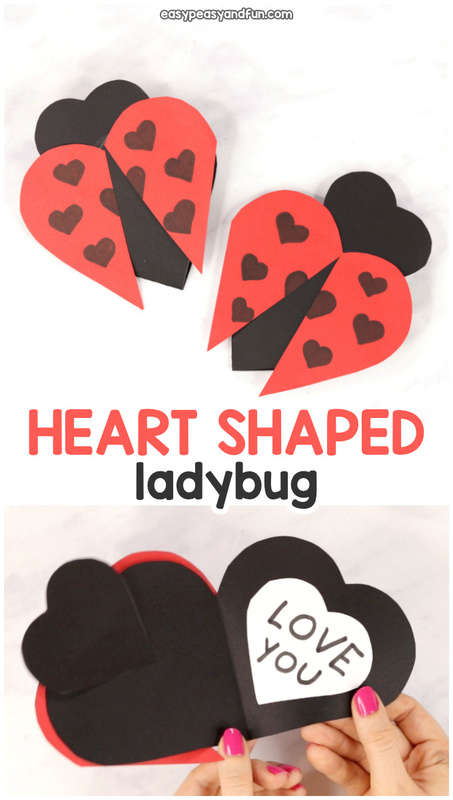 Cut out all the parts for the heart ladybug craft. 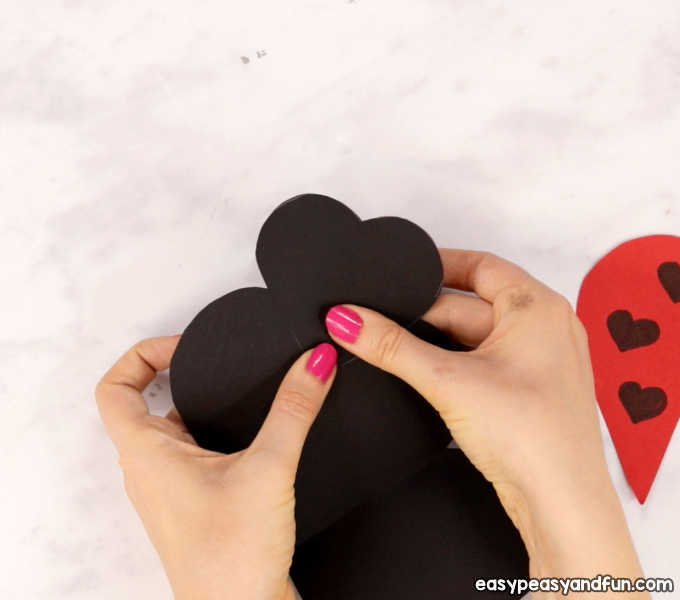 Trace the body part (two joining hearts) on black paper. 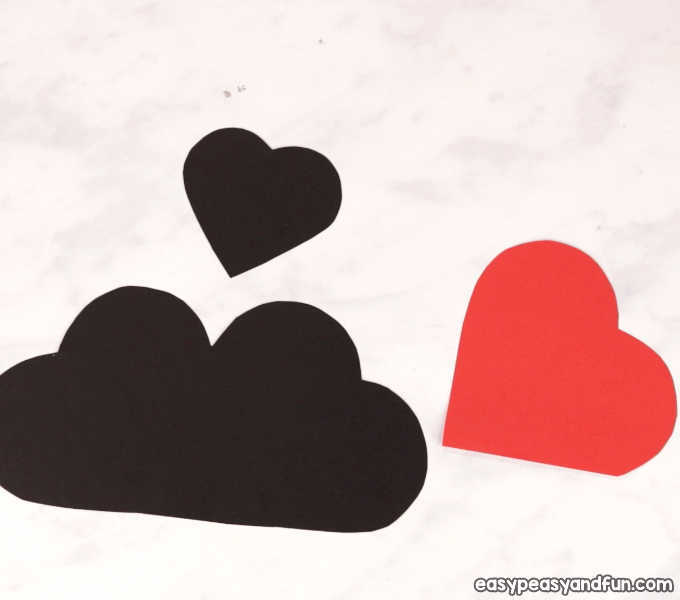 Also cut the head on black paper. 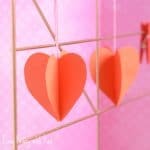 Trace the wings on red paper. 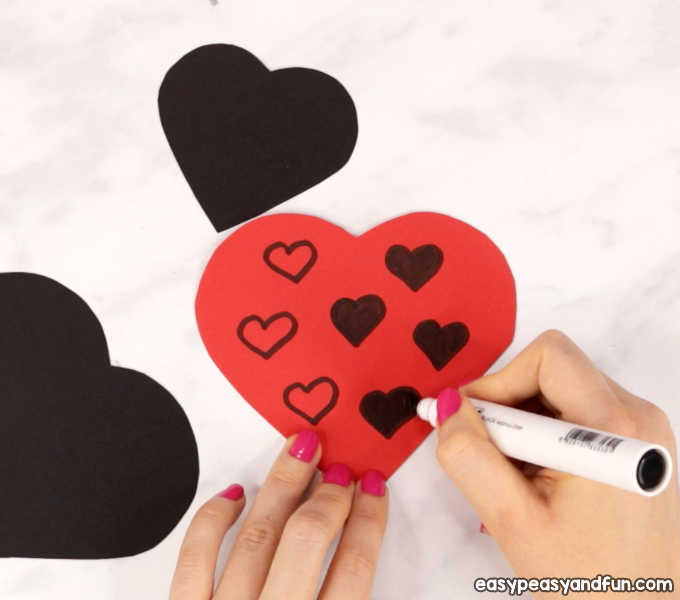 You can cut the 7 small black hearts and stick them on the red heart or you can draw the hearts yourself. 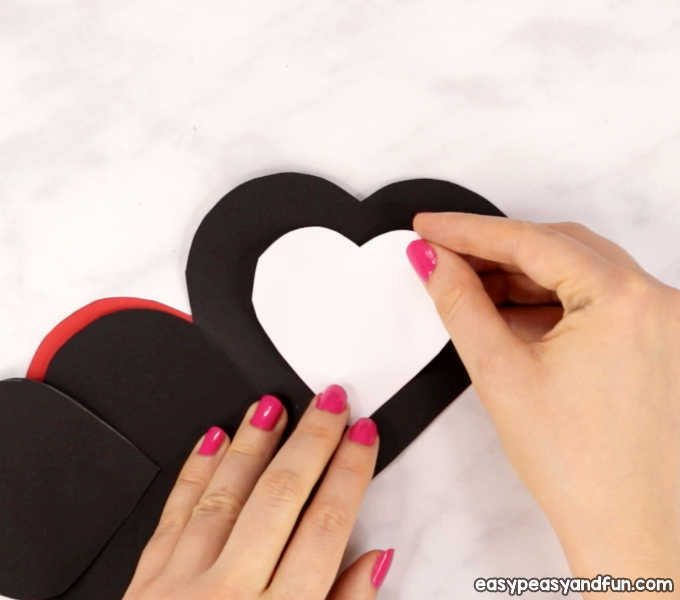 Cut the red heart in half. 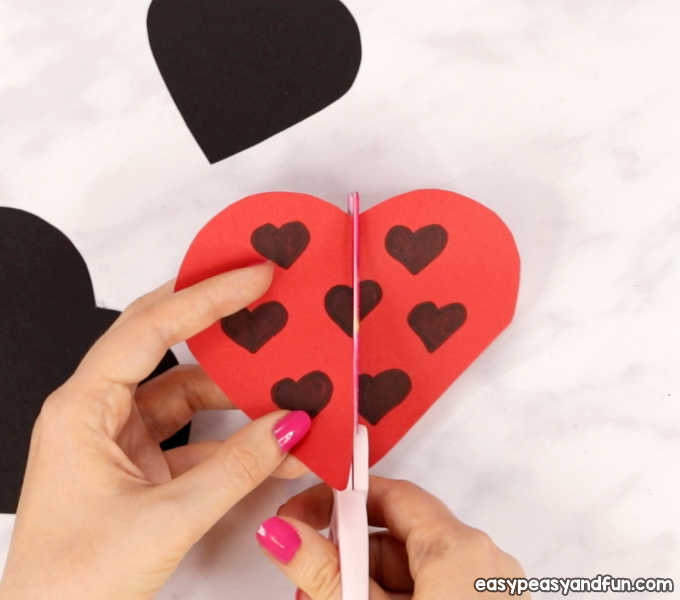 Fold the body (joined hearts) in half – making a heart shaped card. 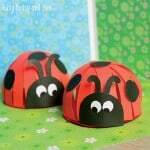 Stick on the small heart for the head of the ladybug. 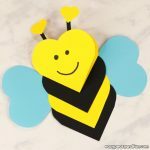 Stick on the two wings, slightly open apart. 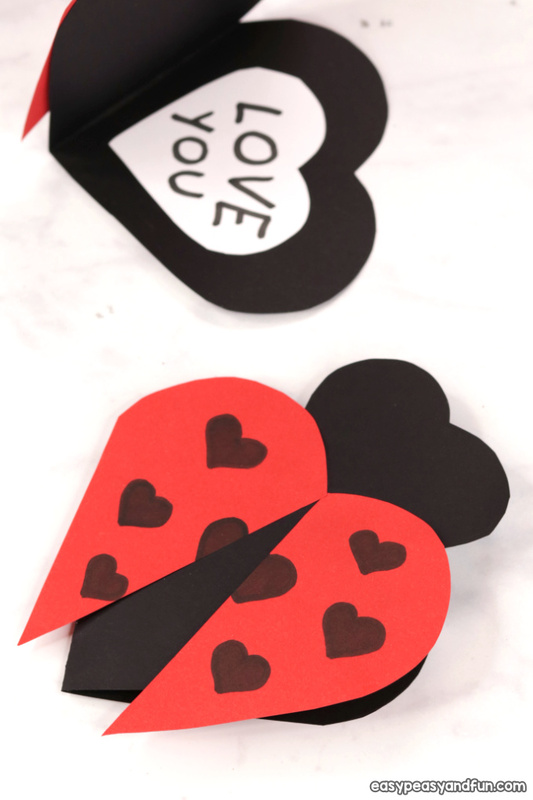 Cut a small white (or any other bright) heart shape (or other shape) and stick it inside the ladybug heart card. 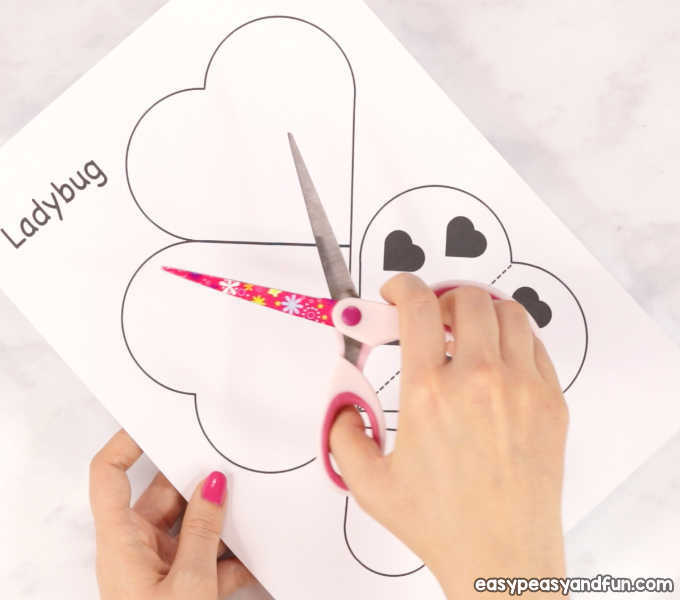 You’ve made an adorable little heart ladybug craft.